So far the members of Congress who think the Treasury Secretary should go don't quite constitute a full-blown caucus, much less anything resembling a majority. But they're expressing their opinions with increasing passion. 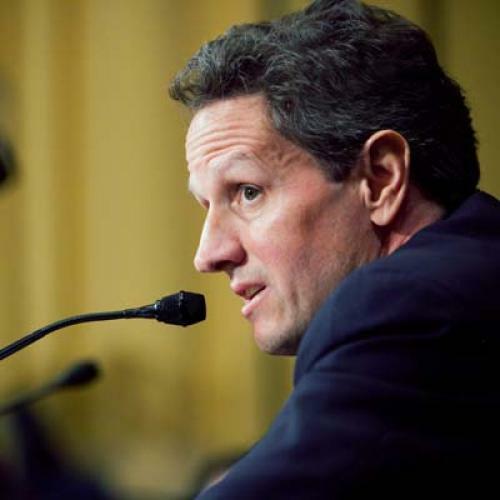 Early this month Democratic Senator Maria Cantwell confessed that she was "not sure" why Geithner still had his job given his too-soft treatment of Wall Street. (A spokesperson later walked back the implication of that statement.) Then, last week, Geithner took some lumps from both Democrats and Republicans in the House. Oregon liberal Pete DeFazio proclaimed that Geithner should resign over his refusal to answer questions about the AIG bailout. At a hearing of the Joint Economic Committee the following day, Texas GOPer Kevin Brady told Geithner that "[T]he public has lost all confidence in your ability to do the job" and pleaded, "For the sake of our jobs, will you step down from your post?" And the risks for Geithner only appear to be growing on Capitol Hill. Someone who recently attended a large gathering of House Democrats told me last week that "there were moments when it turned into a pep rally against Geithner and the Obama economic team." The criticism of Geithner is threefold: First is the continued taint of AIG, whose bailout he orchestrated as president of the New York Fed. The recent report by Neil Barofsky, the special inspector general for the bank bailout (aka TARP), has reignited suspicions that Geithner and the Fed pumped taxpayer money into the cratering insurance company in order to funnel billions of dollars to its major counterparties--banks like Goldman and Merrill Lynch. The second criticism is related to the first--that Geithner is too close to Wall Street generally. This comes partly from his role in the bailouts of Citigroup and Bank of America, partly from his decision to help investors buy the banks' toxic assets rather than nationalize them, and partly from revelations about conversations he had with the CEOs of Goldman and Citi at the height of the crisis. Third, both of these problems have been magnified by the rising unemployment rate and the perception that Geithner is more concerned with the deficit than with job growth. On the merits, I think these criticisms are all slightly off the mark. Certainly it would have been nice to strike a better deal with AIG's counterparties. But, as I've explained before, that needed to be done back in mid-September of 2008, before the government bailed out the company, not in November, when the issue was finally broached. Before the bailout, the government had real leverage over AIG's counterparties, since they would have suffered big losses had AIG gone into bankruptcy (i.e., absent a bailout). The government lost that leverage after the bailout. Likewise, Geithner's decision not to nationalize some subset of banks looks like the right move in retrospect. Citigroup and BofA are still struggling, of course, and it's hard to know when they'll recover (though much of that seems tied to the unemployment rate). But the rest of the country's biggest banks are chugging along reasonably well. The stress tests restored confidence and allowed them to raise capital privately rather than rely on the government. If anything, it's the successful response to the bank crisis that's made Geithner a target--the profits seem too big too soon. That's offensive and cries out for serious reforms, only some of which Geithner supports. But it's hard to argue that we'd be better served had Geithner botched the financial-crisis response. Finally, on the deficit and unemployment, it's true that Geithner has been outspoken about reining in the deficit. It's also true that dwelling on the deficit can seem beside the point or worse with unemployment stuck in double digits. But it's worth considering the role of a Treasury secretary here. As one Treasury official told me a couple months ago, almost every Treasury secretary embraces somewhat more fiscally conservative views than he actually holds,** because one of the Treasury secretary's jobs is to reassure our creditors we'll pay them back. Were Geithner to suddenly argue that the deficit isn't a big deal--even though there's a strong economic case that we should ignore it for the next year or two and focus on stimulus--the bond markets would probably go nuts. By reassuring the bond markets, Geithner buys the administration a little cover. Having said that, it would be crazy for the administration to start cutting domestic spending while the economy is still fragile. But I'd be surprised if that's where we end up. The administration economic team is aware of the dangers of withdrawing stimulus too soon, and they know it's the long-term rather than the short-term deficit that really matters. The only question is how much additional stimulus they're willing to go along with over the next several months. If they turn out to be overly stingy, then some criticism is certainly warranted. But that's a separate question from whether the Treasury secretary should worry about the deficit. He clearly should. So the good news for Geithner is that he's mostly facing a perception problem. The bad news is that it's a pretty damn stubborn one. How can he fix it? I don't have a ton of answers, but a good place to start would be an idea now percolating among congressional Democrats: use the $200 billion-plus in left-over TARP money to pay for a handful of employment-boosting measures, like infrastructure investment, a payroll-tax holiday, and a job-creation tax credit. The administration has so far resisted the idea, prefering to use the extra TARP money to lower the deficit. But if Geithner and the White House endorsed it, they could solve both his too-close-to-Wall-Street problem and his aloof-from-ordinary-folks problem in one fell swoop. "The message would be clear," says Representative Chris Van Hollen, a member of the House leadership. "Wall Street is doing just fine thank you. It's time to use the resources to give Main Street a boost." And it would have the added benefit of stimulating the economy without requiring another wrenching congressional debate, since the money has already been approved. It sure beats having that resignation conversation over and over again. *I'd originally said "no one else with thinking about counterparties last September." But, as commenter sdemuth points out, of course the Fed was thinking about counterparties back then, since that's why AIG posed such a risk to the financial system. I should have been more precise: the point is that no one was thinking about bargaining with counterparties to save a couple billion dollars. They were trying to figure out how to prevent the whole edifice from collapsing--there were trillions upon trillions of dollars at stake--and they barely had time to do that. **I should note that this official wasn't commenting on Geithner's views on the deficit per se. (We weren't talking about Geithner specifically.) He was just illustrating the broader point that cabinet officials and agency heads sometimes have institutional reasons for emphasizing certain positions they wouldn't necessarily go to the mat for if they were in a different job.